700+ DOT Physical Exam Locations for a CDL Drivers Near You! Get a Driver Helpful® CDL Physical Exam at over 700 Locations! Choose from over 700 Certified CDL Physical Exam Locations! Great Prices and Same Day Appointments. Don’t get stuck in the waiting room! If you are looking for a Driver Helpful® DOT Physical Exam for Commercial Drivers, you are in the right place! With over 700 National Registry Certified Medical Examiners, TeamCME is the largest network of CDL Physical Exam locations in the U.S. Our locations offer competitive pricing for Driver Helpful® CDL Physical Exam that other providers can only envy. Many of our locations offer DOT Drug and Alcohol testing, Randomized Drug Programs, Sleep Apnea testing (for as little as $295) and many other DOT and health related services. Our member clinics have Advanced Training to provide cost effective solutions to many of the concerns of drivers today. We give our members cutting edge innovation, convenience, and cost effective tools to outcompete all other providers. Worried about passing your CDL Medical Exam? Our certified medical examiners are dedicated to helping Drivers! With their extensive knowledge of the DOT Medical Exam guidelines, let a TeamCME provider steer you through the CDL Physical Exam process to let you Keep on Truckin’. TeamCME providers will guide you thru the medical standards so you can maintain your DOT Medical Exam Certification for years to come. Two Examiners are better than one! When you get your Driver Helpful® CDL physical exam from a TeamCME provider, your Certified Medical Examiner has another Certified Medical Examiner to help them! They have direct access to Dr. Mike Megehee, President of TeamCME. Dr. Megehee is a FMCSA National Registry Champion and was a member of the FMCSA Team that developed the physician training to become a National Registry Certified Medical Examiner. With your TeamCME Certified Medical Examiner and Dr. Megehee, you will get the Driver Helpful® CDL physical exam your deserve. Same day appointments are routine in most locations. Many of our offices have online scheduling or accept walk-ins. Don’t get stuck in a waiting room! And If 700 CDL Physical Exam locations aren’t enough, try our “Flight Physical” Map with over 5000 Aviation Medical Examiners, many of which may also perform the CDL physical exam. Great Pricing, No Waiting, Same Day Appointments, Innovative Services, and Certified Medical Examiners that know their stuff! Let TeamCME be your source for your next DOT Physical exam for Commercial Drivers. Free Commercial Driver Mobile App! 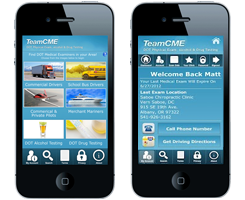 The Free TeamCME Driver Mobile App is the quick and convenient solution for an expired medical certificate or alcohol/drug test collection when at home or away. Search and choose from hundreds of DOT Physical Exam Locations for CDL Physical Exams or DOT alcohol and drug testing using your mobile device’s GPS location or by city and state. With the TeamCME driver mobile app, calling the clinic or getting directions is just a “tap” away. “Click” below to go to the Driver Mobile App page. And we’ve saved the best news for last! Never let your DOT Medical Exam Certificate expire again. Download our Driver Mobile App, save the expiration date or your medical certificate and get “Expiration Alerts” sent to you starting two months before you certificate expires. Save time during your Exam! Download and complete the DOT Medical Exam Report Form before your appointment. (Click Here) or below to Find a CDL Physical Exam Near You!